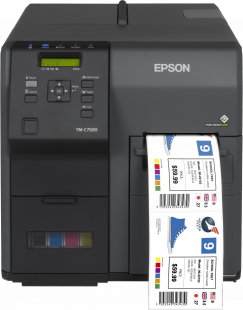 We use the latest Epson technology to provide our customers with a fast-turnaround, outstanding quality packaging label printing service. Our one to many offering means that whatever type of product your organisation produces, we can help by offering you product labels that not only look great but are robust enough to look just as good once they arrive at their destination. Our customers return time and time again for our outstanding digitally printed packaging labels; they know they'll get high quality and great value from Ahead Solutions. We have the ability to print short run full colour digitally printed packaging labels for smaller manufacturers through to medium sized manufactures who are looking to outsource this part of their work. If you do not have your own artwork for your product packaging labels we can help and arrange this for you, in-house by creating a suitable template that is on-brand with your organisation's corporate image. If you have your own art please use the button below to send it to us for a quotation or contact us today on 01254 387227. Quote for Product Label Printing Service? We love to talk to and help our customers. Get in touch with us today on label-printing@aheadsolutions.co.uk or call us now on 01254 387227.